Hazel Boivin Weddings & Events is an award winning full service company providing event planning and coordination, décor styling and floral design. Located in Ajax, Ontario, we pride ourselves in producing unforgettable events, memorable environments and one of a kind floral design for weddings and any social affairs. The company is listed as one of the “Top 3 Wedding Planners” in Ajax for consistently providing high quality service to their clients. Because each client and event is so unique, pricing and packages are tailored exclusively for each of our clients. We love creating inspirational events. Your vision, We create, You enjoy! 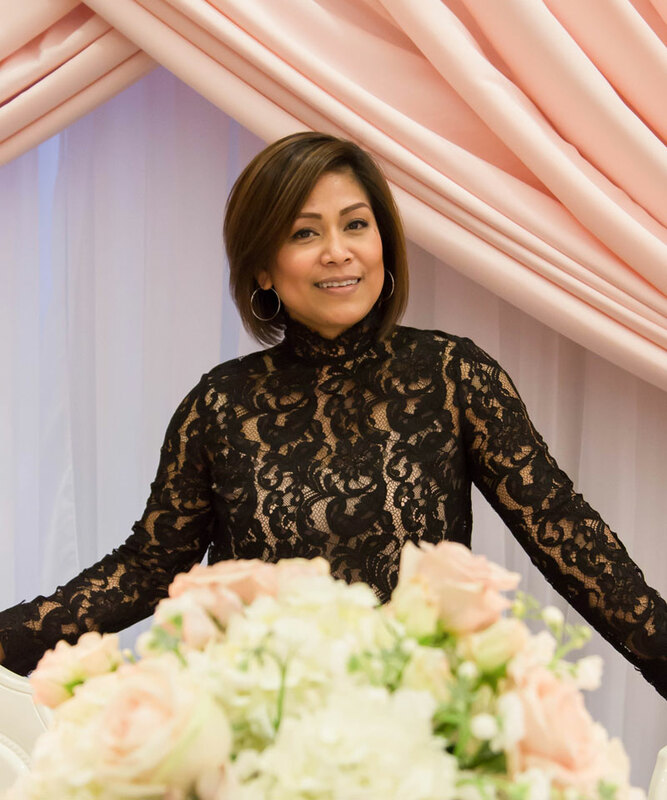 An award winning Certified Wedding Planner, I grew up around tons of family gatherings and celebrations. Growing up in the Philippines, I recall my grandmother cooking up a storm as she prepared a feast to feed an army of her children and grandchildren. I guess I inherited her love for cooking and entertaining. Seeing the joy it brought her laid my future path as a Wedding Planner. Planning my own “Happily Ever After” gave me the taste of that. It was my desire to have my wedding not only be romantic and beautiful, but to create an ambiance that my guests have never experienced before. I enjoyed every moment of that experience and still remember it as if it was just yesterday. Creating a unique event from the roots up and then witnessing it all come together is so fulfilling. Then seeing your clients and their guests genuinely happy with the outcome is very rewarding. How your clients’ characterize you? Personable, kind, warm, organized, detail oriented, flexible, hardworking, knowledgeable, calm, confident, has a can-do-attitude, stylish and funny. When you are not working on events and weddings, what do you enjoy doing? I spend much of my time with my husband and 3 children. Either I am busy Ubering my boys in between hockey games, I am with my husband either riding our own motorcycles or jet skis, or with my guilty pleasure, sitting watching reality TV. I love cooking, baking and entertaining. A genuine person that threw one hell of a party!